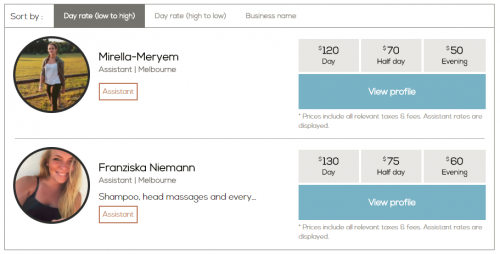 How does a Piloroo booking work? Booking a salon assistant or educator on Piloroo is easy! You search for a salon assistant, book them in advance and rate their work once their session is done. We pay them and issue all tax receipts and invoices. Here is a description of a typical Piloroo booking process. for Saturday and Sunday afternoons next weekend. Use the Piloroo search engine (on the homepage) to find an available hair salon assistant in Melbourne on the relevant dates. The search results page shows two salon assistants are available on your start date, as well as showing their session rates. Clicking through to any of the salon assistant’s Piloroo profile page, we can read more about their experience and we can see their daily availability for the next 3 months. 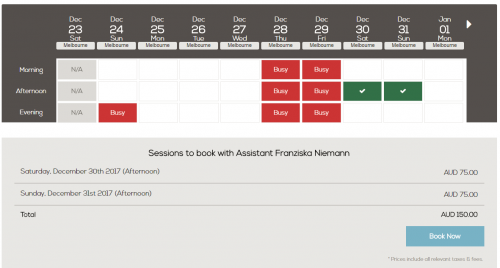 To book, we click the calendar sessions required, which turn green. The total cost of all the sessions we select is tallied below the calendar. We click Book Now and enter the booking payment process. Payments are handled securely by PayPal. You can pay with your credit card or your PayPal account. Piloroo will email you tax invoice / receipts for your booking on behalf of the assistant you booked. We send equivalent tax documents to the assistant you have contracted for the session(s). The assistant you have booked has 24 hours to accept the booking. Once they accept it, you’ll be emailed a confirmation plus your payment tax receipts. If they don’t accept it, a Piloroo team member will contact you and we’ll attempt to find an alternative assistant for your booking. We almost always find a replacement. We recommend the salon assistant contacts you before the session, to confirm requirements, dress code, public transport, equipment requirements etc etc. You can also include this information in the “Job Requirements” when you are making the booking. You’ll be asked to rate and review the assistant, and they will be asked to rate and review you. These ratings are vital to ensuring Piloroo members deliver professional standards of work. Piloroo will automatically pay the assistant 24 hours after the job is completed. We allow 24 hours just in case there have been any problems with the booking that require resolution (very rare). How can I contact Piloroo? Is Piloroo free to join? What do Piloroo customers say? Why do hair salons use Piloroo? What session rates should I charge?